To show what “express yourself” means to us? We thought it was almost impossible to find a photo that showed playfulness and young at heart. Then we found this photo we had taken while we were travelling which is also a big part of who we are. Interestingly, when we look up the symbolic meaning for the panda, the search returns with words such as peaceful, positive outlook on life, gentle strength, caring and compassion. These are values we try to live our lives by. This entry was posted in China, Weekly Photo Challenges and tagged caring, China, compassion, Daily Post, express yourself, gentle strength, panda, peaceful, Photography, playful, Travel, Weekly Photo Challenge, young at heart, zoo. australia day – what will you be doing? So very cute, I ‘d love to see pandas! They are adorable, huh?? Hope you get up and close with these guys one day! I love the idea of using a photos from your travels to express yourself and reminisce! Thank you 🙂 We love participating in these challenges as it gets us to revisit and use photos that often we have forgotten about!! They do look like little chubby kids playing. Soooo cute and their expressions are just priceless! These pandas are too adorable for words! They were so entertaining to watch as well 🙂 Hope you are having a lovely week! This picture is so cute! 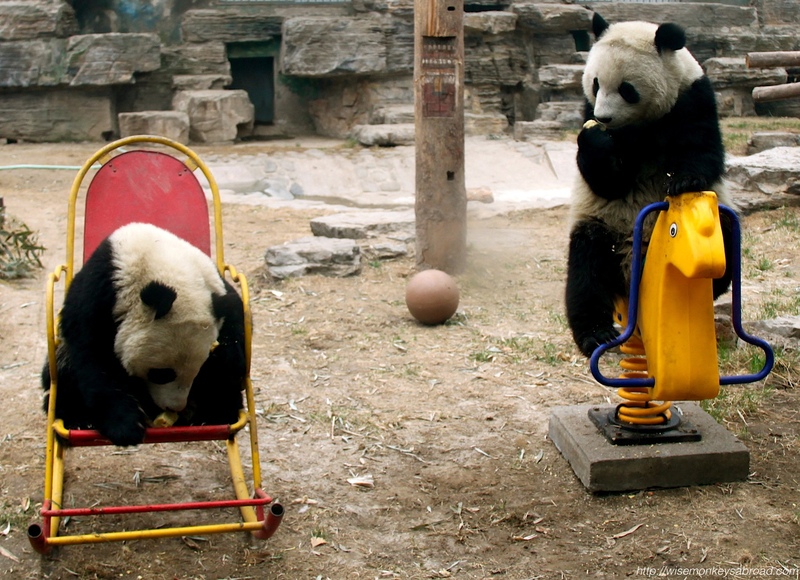 The pandas look like they are having lots of fun! I have yet to see a real panda – I guess I should soon make a trip to the Taipei Zoo or maybe China! I am guessing that you took the picture at a zoo, probably in China. Am I right? Lynda – you are RIGHT on the money there 🙂 Definitely China and definitely a zoo! Hope you are well. Thanks Angela 🙂 Glad you enjoyed it! It looks to me like one has its arms crossed in frustration at the other one sulking. Good take on the theme. Aaah, what a pair of cuties! Oh, and the pandas are pretty cute too! Awwww…. you are too kind 🙂 Hope you enjoy the Aussie Day celebrations tomorrow! Pandas are always a pleasure to see. I have visited them at the zoo a couple of times. The first time I saw them was at the San Diego Zoo in California and I brought home a stuffed panda with me, that still sets on my bookshelf in the computer room. But then, I like all bears! I iwas fortunate enough to see two cinnamon colored bears playing along the road in the edge of the woods in Colorado. It got me excited! What a perfect submission to the theme! I love it. Heheeh – they are such cuties!! We want to just give them a big hug 🙂 Hope you are enjoying the weekend! LOL – no longer a secret now, hey?! Have a happy Sunday. Pandas are such adorable creatures! Don’t you just want to cuddle them? Perfect shot for this week’s challenge. It’s wonderful. They are so adorable and cuddly! Hope you are having a lovely weekend!